Following on from the success of our last Challenge competition (‘Using Open Data for Education’ – you can read more about the winners here), we’re now giving students the opportunity to take some of the Open Data on OpenDataNI and get creative with it! 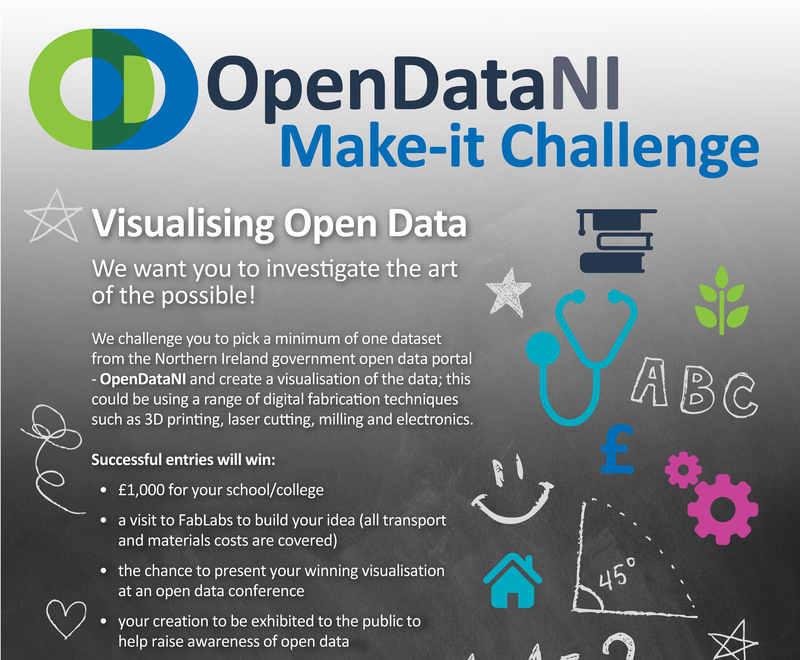 Open to teams of up to 12 students from post primary schools (including special schools) and from further education colleges, the challenge is to design & create something striking and innovative using at least one dataset from OpenDataNI. With the help of our friends at FabLab, successful entries will get the chance to build their project using the latest ‘cutting-edge’ digital fabrication techniques, such as 3D printing, laser cutting, integration of electronics, etc. Entries will be judged based on use of open data, as well as on innovation and impact. Judging criteria can be found here. Teams of up to 12 students may enter the Challenge, with entries to be made on behalf of each team by a staff member at their school/college. The full competition Terms and Conditions can be found here. If you have any questions or queries not covered in the terms and conditions etc., please feel free to use the contact us link at the top right of this page. Feel free to print our flyer and place it on your school/college noticeboard to promote the competition. This competition closed on 12th December at 5pm. This competition is funded by the Department of Finance, and run in conjunction with FabLab Belfast & FabLab Nerve Centre. Open Data Camp is coming to Belfast!